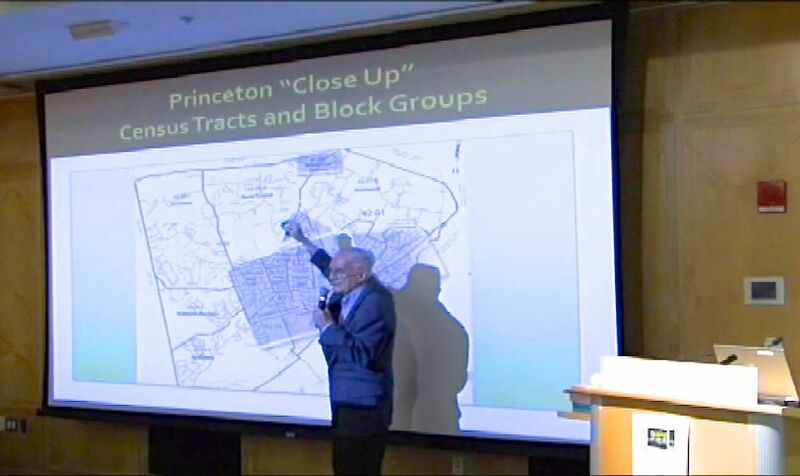 Ralph Widner presents the ‘Princeton Profile 2014’ at the Princeton Future Meeting of December 13, 2014. (click to expand, image from Princeton Community TV). 1. African-American and Hispanic minorities are significantly under-represented in Princeton. The number of black households has been steadily falling in Princeton in recent years. There is a greater hispanic/latino presence in Princeton but we are still significantly below averages for the state and the US in general. 2. Almost half (45%) of renters in Princeton pay over 30% of their monthly salary on housing costs. The federal government defines this threshold as ‘cost-burdened’. A much greater proportion of renters are cost-burdened compared to owner-occupiers. 3. Over 30,000 people work in Princeton every day. Princeton is the 78th-largest municipality in New Jersey, but in terms of daily workforce, it ranks 23rd. 30,615 people work in Princeton. By comparison, the city of New Brunswick, home of Rutgers University, has a daily workforce of 41,884. 4. Even after relocation of the hospital to Plainsboro, 23,615 people commute into Princeton to work every day, and the great majority of them drive. About 3 out of every 4 people who work in Princeton live somewhere else, most commonly the Route 1 corridor, Bucks County PA and Burlington County, NJ. 5. People who live and work in Princeton choose non-car commuting at a very high rate. Although in-commuters prefer the car, people who both live and make their home in Princeton walk to work at a rate that is six times higher than the New Jersey average. Their rate of cycling to work is fifteen times the New Jersey average. 6. Financial contributions from Princeton University to the town make up a greater percentage of the municipal budget than equivalent payments by tax-exempt institutions in other cities. A much greater percentage of Princeton’s municipal budget is provided by the University than is the case in other towns like Cambridge, MA or Providence, RI (home of, respectively, Harvard and Brown). The share of the municipal budget provided by the University has also increased in recent years. What should be the response of the town to this information? What other facts in the statistical analysis did you find that are relevant? Have your say in the comments section below! This entry was posted in Affordability, Alternative Transportation, Community, Events, People, Princeton, Walking and tagged data, Princeton. Bookmark the permalink.